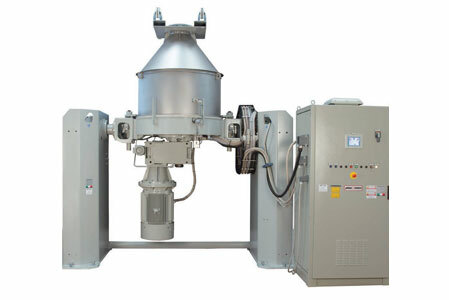 Mixing head and container hopper are divided in two distinct and separate parts, so cleaning times are reduced to a minimum. Different configuration with same or independent speed of the blades or high power version. Storage and transport of the mixtures is also facilitated by direct use of the same container. N.B. The data shown in the table is purely indicative and must be confirmed by PLAS MEC. 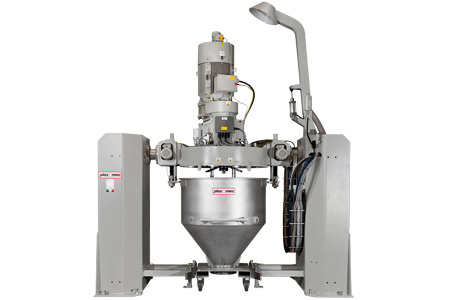 (¹) The weights per batch is calculated with bulk density of 0.5 kg/l. is the most robust, reliable and simple system for the Powder Coating Pre-mixing process existing on the market today. N.B. The data shown in the table are purely indicative and must be confirmed by PLAS MEC. 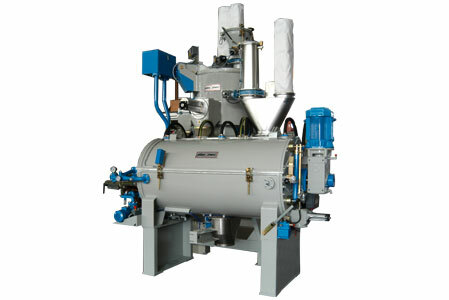 that consists in the combination of the TURBOMIXER TRM and a cooling mixer to achieve the bonding process. offers an excellent metallic bonding effect by a simple and safe process, taking account of the risk of any blast of aluminum pigment by inerting bonding chamber using a controlled nitrogen atmosphere.